I’ve spent a great deal of time this semester impressing upon everyone the ideal of the IUP way. It’s a term I used in my remarks at our annual opening of the academic year. Simply defined, it’s how our university community works together, with positive spirit and civility—to solve problems when they arise but, more proactively, to achieve our shared vision of empowering students to become the world’s transformative leaders through high-quality academic programs, strong support structures, and interconnected, hands-on learning experience outside the classroom. Perhaps it’s better coined as a promise to do things in a way that is particular to IUP—collaborative, with an eye to the future and employing practices that we know to be successful but not being shy about new and innovative ways of doing our work, all with the shared desire to empower our students to become leaders and solutionists and to have the most positive impact on the world. That promise’s return on investment shines brilliantly, as demonstrated by our successes this semester with our alumni constituency. Record numbers of alumni returned for homecoming, and shortly after that, we hosted reunions for both the marching band and ROTC. In each case, an unprecedented number of alumni returned to recall the good times, to reconnect, and to make new friends. 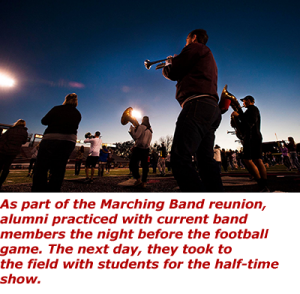 It shows our alumni are truly invested in our mission and vision and their IUP experience. After all, we are a community that takes care of community—whether it’s a network of people or a place in which people work, learn, and live. Assessment, discussions, and changes in Jefferson County’s economy and workforce have led us to the conclusion that we need to make changes at our Punxsutawney campus to help our students and the region reach their full potential. In some ways, we will return to the campus’s original intent—to be an educational resource to Punxsutawney, Jefferson County, and the surrounding region. 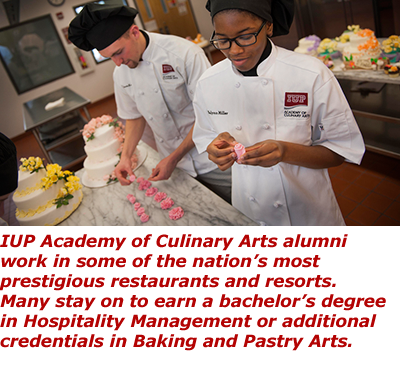 Starting in fall 2017, rather than assigning large numbers of freshmen, who originally applied to the Indiana Campus, to Punxsutawney, we will provide first-year classes to local students and offer the Associate of Arts degree in General Studies with concentrations in Culinary Arts, Business, and Health Office Administration. We are also working with local school districts to expand our dual enrollment program to high school students in that area, giving them the opportunity to get a great head start with a higher education degree. We continue to discuss with area stakeholders the possibility of other programs and degrees the region needs. We will further emphasize and expand Culinary Arts by looking for more opportunities for students interested in Hospitality Management and, I hope, through completion of a culinary master plan, build a new kitchen facility for this programmatic gem. And, I’m pleased to report on even more changes. We now are accepting applications for our new programs—the bachelor’s degree in Public Health and the PhD in Counselor Education and Supervision, and we expect to make similar announcements about other exciting and innovative new majors—particularly Digital Science and Environmental Engineering. Among all the innovation and new programs in development, we have a most unusual one that received a boost from the National Science Foundation. Justin Fair, and Anne Kondo of the Chemistry Department and colleagues from across disciplines are developing a new minor in Teamwork. The group did their homework by talking to employers to learn what skills they needed in their workforce. As Dr. Fair has noted, IUP is leading the nation on this topic. We are creating the blueprint for other universities to emulate. I could spend hours writing about all the positive energy and activity that is happening here at IUP, which is a reference to something else I said in my annual opening remarks. This university will never have a difficult time finding good things to brag about. The trouble is knowing when to stop!